October marks Breast Cancer Awareness month and while most brands jump on the pink and charity bandwagon with a variety of products, I couldn’t think of a better way to do my bit than courtesy of some calorific treats. Which is why I signed up to trial the Positively Pink Afternoon Tea at the Wyndham Grand. 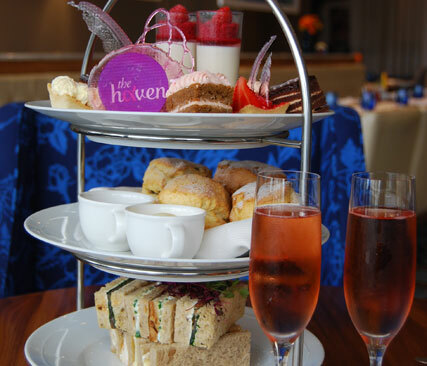 Of course, this isn’t just any afternoon tea (and I’m not referring to the pink theme) the treats have been carefully created with the help of local cancer charity, The Haven, to contain key superfood ingredients such as green tea, ginger and spinach. While it all sounds a bit too healthy for a weekend gossip session with the girls, the culinary geniuses at Wyndham Grand (nestled neatly at Chelsea Harbour) managed to make the afternoon tea, with optional pink champagne, an indulgent and very tasty affair. The sandwiches were delicious regardless of their health benefits, but the onion bread, free-range egg mayonnaise and smoked salmon, baby spinach and cream cheese won it for me. You can’t go wrong with clotted cream, jam and scones but I bypassed these in favour of the top tray of delights. Think pink champagne jelly (am not sure there are any superfoods present in this but was very tasty) a pistachio, raspberry and white chocolate slice, sticky ginger cake but the best of all was the green tea éclair with a sticky lemon glaze – this is worth every single crumb that’s going to stick to my hips. And if you could tear yourself away from the three-tiered beauty of treats before you, drink in views of Chelsea Harbour. It’s the perfect post-Kings Road shop relaxation you’ll need as you sink into your plush seat in the hotel’s bar area. Prices start from £25, and £35 with champagne ,with 10 per cent going to The Haven charity. The Positively Pink afternoon tea is served until 31 October. There is also the option to purchase a Robinson Pelham (robinsonpelham.com) pendant, £195, with all profits going to The Haven.